OSWALD / LONDON Qatar is under growing international pressure because of millions of terror dollars allegedly being pumped to Islamic State and other radical Islamist movements from offices in the wealthy emirate on the Persian Gulf. Huge amount from generous supporters and ransoms washed white in the small oil state are channeled disguised as humanitarian charity to terrorist movements such as Islamic State without the regime in Doha dealing effectively with the problem, says Western leaders and analysts. And according to a report from the Danish Treasury Department some of the 100 Danes that Islamic State got help from an extremist who is funded from Qatar. Qatar’s central role as a kind of financial mecca of Islamic State has led to calls for economic sanctions, and it can put Denmark in a difficult dilemma. Denmark’s largest company, AP Møller-Mærsk plays a key economic role in Qatar, where more than a third of the country’s oil production – 300,000 barrels a day – according to the company’s website is brought up by Maersk Oil. Although Qatar does not contribute with any fighter jets, the regime in Doha is officially supporting the coalition against the Islamic State, and the United States has an important air base in the country. But at the same time the Qatar government – according to critics in the West – ignore that traffickers are using Qatar to white wash terrorist money. Critics argue that the regime in Qatar could easily stop the flow of money, if you would. But it does not happen. ‘Qatar should be thrown out of the alliance. We have a war against the Islamic state, and we can not have someone on the team that is also on the other side,’ says Søren Espersen, foreign policy spokesman of the Danish People’s Party, but he rejects sanctions against Qatar, ‘If the players ride several horses, it is very appalling. For reasons of principle, I am against sanctions – whether it’s against Russia, Burma or Qatar – because it always hits our own business people. And in this case, I do not think that sanctions pose a real threat to Qatar because the country is so rich that it can ignore such things,’ says Søren Espersen. Former Foreign Minister Holger K. Nielsen (SF) will not, however, rule out that sanctions against Qatar may prove necessary, “Economic sanctions can be an option. Seen from our side it will certainly not be Maersk that going to stand in the way of sanctions,’ said Holger K.
Nielsen who, however, believe that the United States first must find out if the accusations against Qatar is valid “The Americans must address Qatar and clarify whether the allegations are correct. If they are, it will naturally have consequences, because we obviously can not accept that Qatar is running a double game,’ Nielsen said. 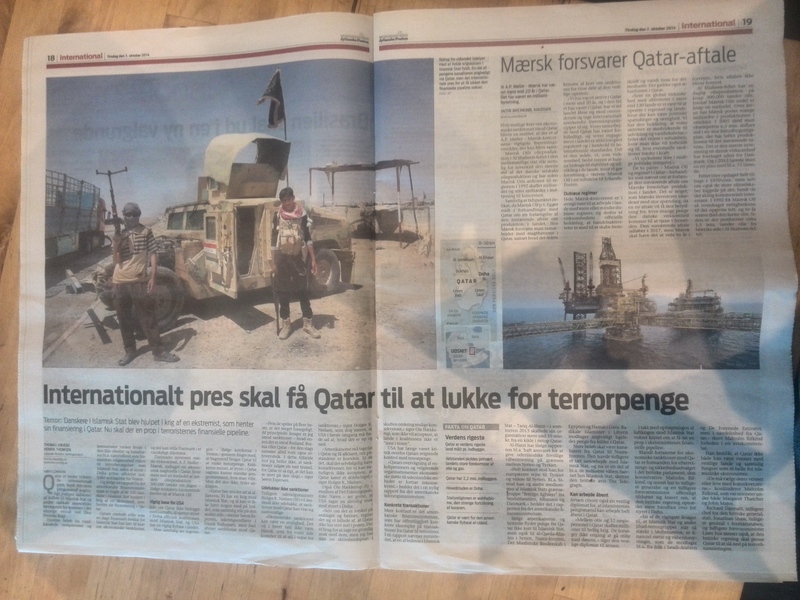 Also Ole Hækkerup (S) – a member of the Foreign Policy Committee – would like to see the United States take a serious talk with the government in Doha: ‘Although there is a difference between allegations and evidence, there is a picture of that Qatar is doing something criminal. We need to take a thorough talk with them, but I do not have a clear plan concerning concrete consequences against Qatar’ says Ole Hækkerup, who will not accept that countries in the coalition is playing a double game. The United States has long been critical of Qatar’s lack of control of terrorist money. ‘Qatar’s monitoring of individuals and charitable organizations’ financial support for foreign entities are still inconsistent,’ says a recent report from the State Department. The US Treasury Department speaks more frankly, and has published specific examples of transactions from Qatar to terrorists. In a report the Ministry mentions that one of the leaders of the Islamic State – Tariq Al-Harzi – in the summer of 2013 received more than 10 million for his organisaiton from a source in Qatar. Al-Harzi are, among other things, responsible for providing weapons training for foreign volunteers on the border between Syria and Turkey. “Specifically, he arranged Europeans’ travel to Turkey and on to Syria. He helped fighters from Britain, Albania and Denmark to enter the Islamic States group of “foreign fighters”‘, says the report from the American ministry. According to the Americans and British, money from Qatar is not only going to Islamic State, but also to an al-Qaeda branch in Syria, Nusra Front, the Muslim Brotherhood in Egypt and Hamas in Gaza. Radical Islamists in Libya allegedly receives money from sources in Qatar. Large amounts are supposedly being channeled from Qatar to the Nusra Front. Nusra Front used to have a close cooperation with the Islamic State, and now a part of the weapons they bougths have ended up in Islamic State, writes the British newspaper The Telegraph. The newspaper also quotes a Western diplomat saying that the Islamists’ money men can work openly in Qatar. “Between eight and 12 key persons in Qatar provide millions of dollars to holy war. They do not even try to go quietly,’ said the Western diplomat to the newspaper. As the escalation of the air raids against the Islamic State happens, the demands to put a plug in the extremist financial pipeline grow. Among the advocates of economic sanctions against Qatar is the chairman of the Intelligence and Security Committee in the British Parliament, the Conservative Malcolm Rifkind, and most recently, two former generals and a former defense minister publicly endorsed the requirement that the British Government acts more robustly against the regime in Doha. ‘One of the main reasons why the Islamic State and other jihadi terrorist groups is so powerful in the Middle East, is the financial aid and arms supplies which they receive from people in Saudi Arabia and the United Arab Emirates, but in particular from Qatar,’ writes Malcolm Rifkind in a newspaper comment. He states that Qatar can not both be friends with western countries and also act as a haven for Islamist extremists. ‘They must choose their friends or live with the consequences,’ concludes Malcolm Rifkind, who was a minister under both Margaret Thatcher and John Major.